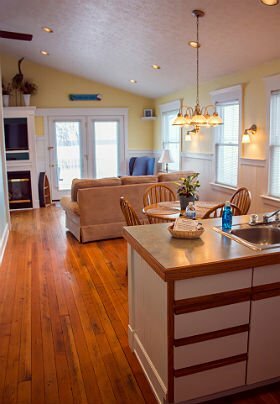 Situated on the shore of Lake Erie is our cozy and tranquil beach house. 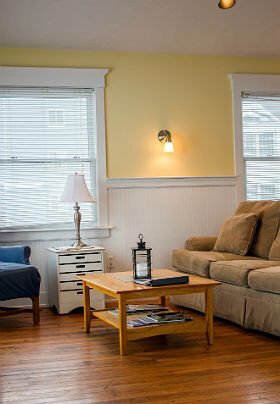 Our beach house rental is a great choice for Geneva-on-the-Lake family vacations or even a honeymoon or romantic getaway. Housed above the wine cellar and tasting room, the Beach House has a spacious bedroom, living and dining area, kitchen, and bathroom. Spectacular Lake Erie views can be seen throughout our Geneva-on-the-Lake house rental. The outdoor deck is accessible through the bedroom and living room by glass doors. There are windows/glass doors on the east, north, and west sides of the building, offering a panoramic view of Lake Erie and the Geneva Marina. 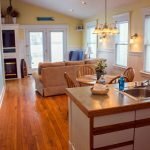 The Beach House has central air and heat allowing year-round rentals. Located on the west side, the bedroom features a queen-size bed. The bathroom has a two-person Jacuzzi tub overlooking Lake Erie and a two-person shower. A hairdryer, soap, shampoo & lotion, and an iron & ironing board are provided. The kitchen is furnished with dishes, pots, pans, utensils, coffee pot, toaster, microwave, refrigerator, stove, and dishwasher. The dining area, located on the east side, has a table for four and offers a spectacular view of Lake Erie. The living room area, also situated on the east side, includes an electric fireplace, and cable television and a CD player. Prices for the house rental are priced for two people. (The rates do not include a 6.75% sales tax and 8% bed tax.) The Beach House can accommodate two adults & two children. There is no charge for children under 5. Children aged 5-10, $10 per person per night. Children over 10, $20 per person per night. 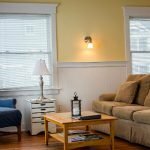 The house rental requires a 2-night minimum for all rentals from Memorial weekend-September, however, a 3-night minimum is required for the 3 holiday weekends (Memorial weekend, 4th of July & Labor Day weekend.) The remainder of the year, there is a 2-night minimum for all weekend rentals.